Luchtballonvaart in Bagan - 2e persoon zweeft gratis! home > nieuws > Ballonvaart in Bagan - 2e persoon zweeft gratis! Ballonvaart in Bagan - 2e persoon zweeft gratis! Het ballonvaartseizoen is namelijk verlengd tot 10 April 2019. Maak dit seizoen nog een ballonvaart en de tweede persoon mag gratis mee! Actievoorwaarden: de actie is geldig voor nieuwe boekingen (vanaf 22 januari '19) waarbij u tot 10 april '19 de ballontocht kunt maken. Bekijk onze Myanmar Rondreizen voor mooie reisvoorbeelden waarin u deze activiteit kunt opnemen. Nog niet overtuigd van de schoonheid, bekijk dan vooral even de bovenstaande compilatie en lees het interview met Chief Pilot Mr. Mark Simmon. Mark "Nobby" Simmons, Married to Janet, son Henry and daughter Lewella. I have been working for Balloons over Bagan since 2007 and in 2014 was appointed Chief Pilot. How did you become a balloon pilot? My first balloon training flight was on 4th May 1989. I was fortunate enough to start working as a Ground Crew for my friend’s father who ran an advertising balloon company in the UK. It took two years of flight training to achieve my Private Pilots License in January 1991, and then my Commercial Pilots License in December of the same year. At the age of 22 years old I was at the time the youngest Commercial Hot Air Balloon Pilot in Europe. I hold a couple of ballooning World Records, one of them being the Youngest Pilot to Captain a Balloon across the English Channel in 1992. This flight took a lot of preparation and good luck with the weather but to fly from England all the way to France was pretty special. I also met my wife Janet whilst flying Switzerland. She was taking a year sabbatical from University in Toronto and I was attending a winter balloon meet in a town called Chateau d'Oex when we first met so flying in the Swiss Alps holds fond memories for me. Which other places in the world do you fly? I have flown in over 35 countries during my career and I've seen some beautiful parts of the word, from the deserts of Morocco to the snow-covered mountains of Switzerland, all from the basket of a hot air balloon. What’s your favourite part of your job as a balloon pilot? Working abroad and being able to travel with my family. Janet and I made the decision to homeschool our two children so that we could stay together as a family during my contracts away from home. We first arrived in Bagan on my son Henry's 2nd birthday whilst my Janet was pregnant with our daughter Lewella. He will turn 14 in January and Lewella is now 11 so they have spent their childhood living in both the UK and Myanmar. For my wife and I we feel that we couldn't have given our children a better start in life, seeing the world and understanding different cultures. 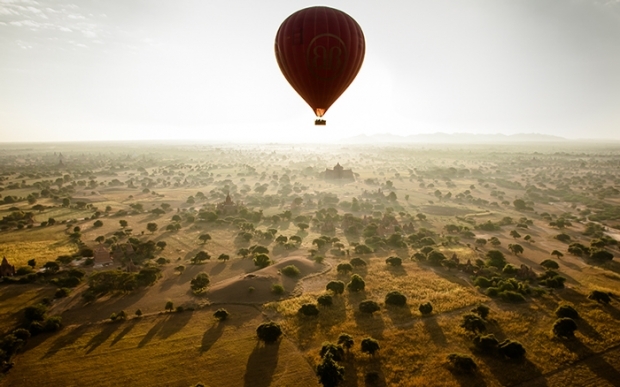 Why should a guest fly over Bagan? Of all the wonderful countries I have flown in Myanmar is definitely at the top of my favourite list. The scenery in Bagan looking down on the temples spread out across the Ancient Monument zone is just breathtaking. And from a piloting perspective the very calm weather conditions are just perfect. Meer weten over een ballonvaart in Bagan, of algemene vragen over reizen naar Myanmar? Neem contact op met Floor.